Vaccinations will help keep your pet healthy and happy. Elam Animal Hospital follows the guidelines set by the American Animal Hospital Association (AAHA) for the most current vaccine recommendations. We tailor your pet's vaccinations on an individual basis, depending on your pet's age, lifestyle, breed, size, and environment. Some vaccines are administered annually, while others are recommended every six months or every three years, depending on the vaccine type. Please call us today to learn more about our vaccine packages and to set up an individualized vaccination schedule for your pet. These diseases are not only common, but they also represent a serious threat to your dog's life. Most dogs will encounter these diseases at some point in their lives, making this vaccination extremely important. A combination vaccination for all four diseases is recommended every three years after the puppy boosters. This fatal viral disease affects all warm-blooded animals, posing a risk to humans as well as to dogs and cats. 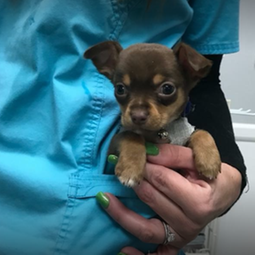 Puppies should receive their first Rabies vaccination between 12-16 weeks of age, with a booster administered at one year of age. Dogs should receive an additional vaccination every three years after the first year. This is a bacterial infection that attacks the kidneys, and is transmitted through the urine of wild animals such as raccoons and rodents. Dogs may contract this disease through contaminated puddles or outdoor water bowls. Leptospirosis is becoming a more common disease and can present a serious threat to your pet's health. Dogs at risk of being exposed should be vaccinated annually. This disease is commonly known as kennel cough. Symptoms include a dry hacking cough that may last six weeks or longer. This disease is caused by a highly contagious bacterium. Dogs are commonly exposed to the disease in boarding kennels, obedience schools, public dog parks, grooming facilities, and veterinary hospitals. Dogs at risk of exposure should be vaccinated yearly. Mosquitoes are capable of transmitting heartworms, making exposure very likely, especially in South Carolina. Your dog's monthly heartworm prevention also protects him or her against intestinal parasites that can be transmitted to humans. Heartworms can cause heart and lung disease, which can be fatal. Puppies should begin heartworm medication at eight weeks of age and should continue monthly treatment for the rest of their lives. Heartworm medication also serves as a monthly parasite control. This is a combination vaccination administered every two to three weeks between 8­ and 16 weeks of age. Cats receive a booster at one year, with additional boosters every three years. This vaccine helps to safeguard your cat against three viral diseases: Rhinotracheitis, a herpes virus; Calici virus, which causes upper respiratory infection; and Panleukopenia, also known as distemper. These potentially fatal viruses are all easily transmitted between cats. This fatal disease affects cats in the same way it affects dogs and humans. The initial vaccination should be given at 12-16 weeks of age, with non-adjuvanted Purevax boosters administered annually. Some evidence shows that these one-year vaccines are less likely to cause tumors than adjuvanted three-year vaccines, therefore decreasing your cat's risk of developing sarcomas at the injection site. This is an often fatal viral disease that suppresses the normal functions of the feline immune system and inhibits an afflicted cat's ability to fight off disease and infection. Transmission typically occurs through grooming, sharing water bowls, breeding, fighting, and contact with saliva. It is recommended that cats receive the first vaccination at nine weeks with a booster at 12 weeks, and a booster once a year thereafter.